This post tracks developments in “The Creepy Line,” a documentary on the little-known use of Orwellian methods by search engines and social media to manipulate public opinion. The Creepy Line can now be watched on demand via Amazon at this link. FilmFestivals.com has added The Creepy Line to its list of available films, with details and bios. The Creepy Line now has an official website, with interactive links that enable the user to see what Google and Facebook know about them. It also has details about local showings and recent press stories. A form has been added to the Creepy Line website to facilitate local showings. Per Eventbee, a screening has been scheduled for The Creepy Line at E Street Cinema. City Cinemas 123 has sold out of tickets for the initial screening on September 17th. A Google staffing meeting video released anonymously to Breitbart News shows management openly depressed following the 2016 US election, and promising to do something about it by using Google to “fight fake news” and “educate low information voters.” That is, to manipulate search results in order to manipulate…you. Fox News briefly interviewed the Creepy Line producer on the subject of Big Tech’s influence. The Internet Movie Database (IMDB) has created a page to track developments of this upcoming documentary, usually a good sign that a film is progressing. 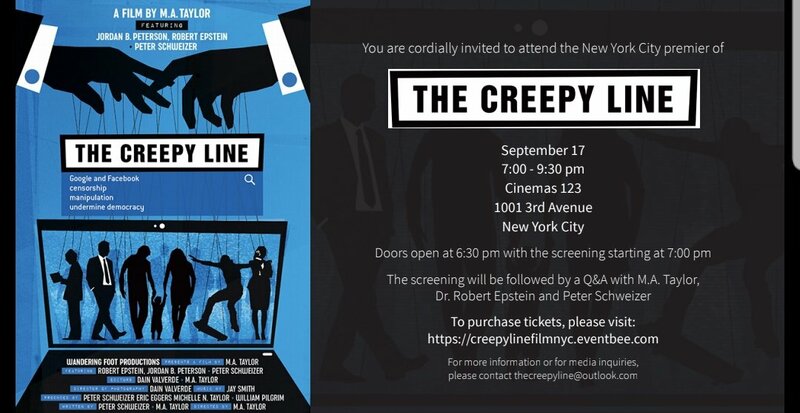 Per The Daily Caller, an initial screening has been scheduled for The Creepy Line at City Cinemas 123. More details here.